44 • February 2017 www.concreteproducts.com BRIEFS ACTIVITIES & APPOINTMENTS Hilti North America President and CEO Cary Evert will retire at the end of March, closing a nearly four-decade career during which he has held nine roles, including three international assignments. "I have seen Hilti develop into a leader in the North American construction market and look forward to watching Hilti North America continue to grow under the leadership of [successor] Avi Kahn," notes Evert, who joined the Tulsa., Okla., company in 1980 and has been at the helm since 2005. Kahn transitioned to his new role in January after serving as Hilti Canada general manager for nearly six years. He has progressed through the ranks since starting in 2004 as a territory sales represen- tative for construction in San Francisco, and from there was appoint- ed to regional manager in San Diego and Hawaii, then Chicago-based West Great Lakes division manager. Martina McIsaac has succeeded Kahn, transitioning from her post as division manager for the greater Toronto area while joining the Hilti North America executive management team. She arrived at Hilti Canada in 2013 as a senior manager candidate and was appointed division manager the following year. Kim Running has taken a stake alongside Todd Scharich in Michi- gan-based Decorative Concrete Resources, which supplies materials and provides education and technical support to ready mixed pro- ducers, contractors and design/build professionals. She continues as a business manager, based in Saginaw, and is credited for her valued role in customer supply chains. Cary Evert Avi Kahn Martina McIssac CONCRETE SOLUTIONS $(! (&#$"!# #((''%( "(&'%( '!%$(&(''% '#'( #("'(%'!$"(&#%'"'( #$"%( ( $(&%(&"&($&%'(&%(&'%'! !#(!#"%(%!#'$(& $"$(!#(%!#'( "($&" &#$( %'%(%&(&%( #'(&($"!#!%(%!#'$(&%(!$($ "&($"&'# #''%(! ($&" &#("&( "(&%($"& #''$('% '( $$'$((&(&%(%!#'$(& $"$ !#(&&#'#"($&" &#$(!%'($'% '("%&(!# ! "&% '(#!" &# '('! 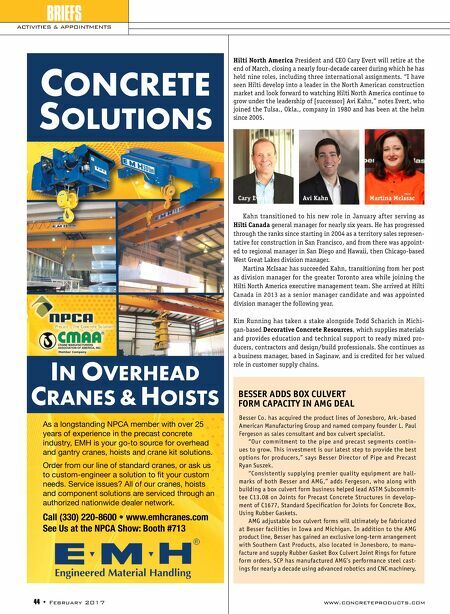 '%(#'"&%( Call (330) 220-8600 • www.emhcranes.com See Us at the NPCA Show: Booth #713 IN OVERHEAD CRANES & HOISTS BESSER ADDS BOX CULVERT FORM CAPACITY IN AMG DEAL Besser Co. has acquired the product lines of Jonesboro, Ark.-based American Manufacturing Group and named company founder L. Paul Fergeson as sales consultant and box culvert specialist. "Our commitment to the pipe and precast segments contin- ues to grow. 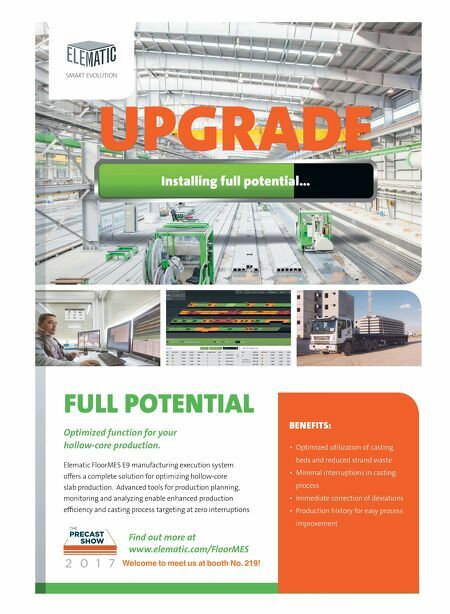 This investment is our latest step to provide the best options for producers," says Besser Director of Pipe and Precast Ryan Suszek. "Consistently supplying premier quality equipment are hall- marks of both Besser and AMG," adds Fergeson, who along with building a box culvert form business helped lead ASTM Subcommit- tee C13.08 on Joints for Precast Concrete Structures in develop- ment of C1677, Standard Specification for Joints for Concrete Box, Using Rubber Gaskets. AMG adjustable box culvert forms will ultimately be fabricated at Besser facilities in Iowa and Michigan. In addition to the AMG product line, Besser has gained an exclusive long-term arrangement with Southern Cast Products, also located in Jonesboro, to manu- facture and supply Rubber Gasket Box Culvert Joint Rings for future form orders. SCP has manufactured AMG's performance steel cast- ings for nearly a decade using advanced robotics and CNC machinery.